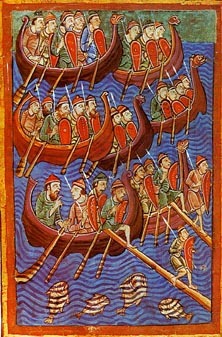 English: Danes about to invade England. From "Miscellany on the life of St. Edmund" from the 12th century. Français : Les Danois sur le point d'envahir l'Angleterre. Illustration d' Alexis Master. In Abbon de Fleury, Passio Sancti Edmundi, Regis Orientalium Anglorum et Martyris. Source: Miscellany on the life of St. Edmund (MS M.736 fol. 9v ). Bury St. Edmunds, England, ca. 1130. Pierpont Morgan Library, New York.